What's New in Release 2.2? In this release, we offer compatibility with Salesforce Lighting platform. Agents on Lighting platform can communicate with their customers using the Virtual Office Communication Panel. 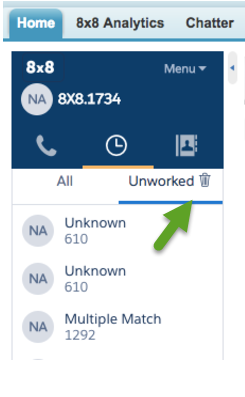 A quick delete feature to clear the list of Unworked calls, which are calls that were not logged. This allows users to start fresh with a clean and empty Unworked list. The feature appears as a trash can when the Unworked tab is selected within the Recent Calls section of the Virtual Office for Salesforce Communication Panel. For known issues and limitations, click here. What's New in Virtual Office Communication Panel Release 2.0? We have introduced some major enhancements in this release that are targeted to improve the efficiency of sales teams. Sales representatives, handling high call volume and managing interactions in Salesforce will find these improvements useful. We recommend that you train employees on the use of the new integration. Updated Interface: The user interface is reimagined and updated completely. The navigation menu is now moved to the top with three items: Phone tab, Call log tab, and Directory tab. Learn more. Enhancements in Call Log: Previously, if an incoming call retrieved multiple matching records, you had to select the desired record at the beginning of the call. But now, you have the flexibility to select the desired Salesforce record at anytime during or after the call. Enhanced Ability to Assign Call Logs: Ability to assign call logs to existing contacts or new contacts is now improved. You can assign the call log to an existing Salesforce record of any supported object type and at any time during or after the call. You can also create a new record (Lead, Contact, or Account) and assign it. Improved ability to search records based on name, case numbers, and more. Possible match function allow the rep to assign any supported object that is open in Salesforce (Lead, Contact, Account, Opportunity, or Case). Introducing Call Drawer: For quick access, call logs are organized in a call drawer for agents to review and follow-up. In the Phone tab, click Call Logs to open the drawer. Tracking Incomplete Call Logs Via Recent Calls (Unworked): If agents are busy and unable to assign the call log and add notes during or after a call, these calls are tagged as Unworked and listed in the Recents tab. This allows agents to access those logs quickly and process them efficiently. This allows agents to know quickly which calls they need to add information to keep their account teams and management up to date on prospect communication. The system adds a default subject line (Call with John Smith) which can be revised and saved. Ability to leverage existing call outcome choices: : You can now use your existing list of call result choices as defined in the Call Center settings within Salesforce, or use a Salesforce pick list. The selection made by the rep is then stored along with the call log information into the task object.